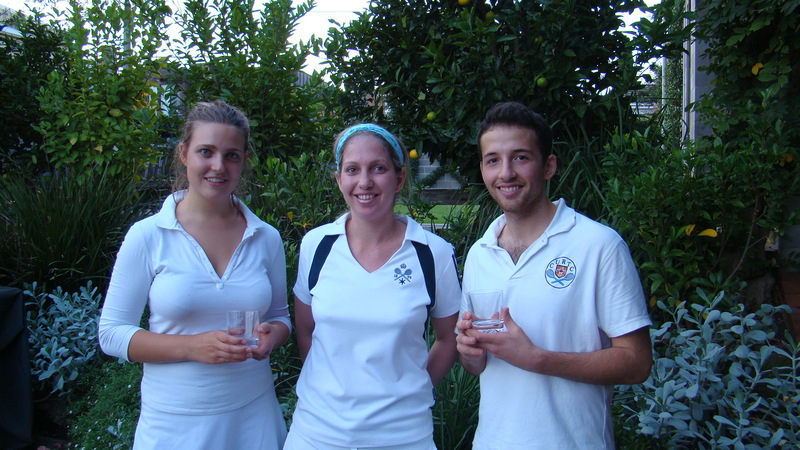 The Exhibition Street Cup was played over the weekend of 21-22 May in what is the Club’s premier handicap knockout event. Of the 27 initial entrants into the singles, it was James “baby G” Gould and Julian Snow who made it through the draw and into the Sunday final. James playing off 23 and Julian off +4 were well matched and kept everyone entertained as each struggled for the ascendancy. Julian played his usual game, you know, the heavily spun Sidewall, the heavily weighted ground-strokes and volleys to impeccable length and this was enough to keep him in the game as the match was tied at 5-all. However, all the while James was playing his mixture of left-arm rolled forehands, Railroads and excellent retrieval shots which placed Julian under constant pressure. The combination of the handicap and James’s constant aggressive play eventually exposed a crack or two in Julian’s armour; a difficult forehand missed here, a pressure volley missed there were just enough to allow James to grind ahead. It was close all the way but eventually James took out the struggle 9 games to 6. James’s victory playing of 23 makes me feel sure that sometime recently we were congratulating HIM on a win and saying that that would be the last time he played off a handicap of more than 20! The Doubles Report to follow shortly. The Ladies game saw a new World Champion crowned at the RMTC on Saturday 14th May when Clair Vigrass lived up to all the rave reviews by defeating Karen Hird. In the first set her overbearing power game was on display which when combined with an array of subtle serves such as the Drag, Chandelle and Sidewall – she did not serve one Railroad – made for a seemingly overwhelming challenge for Karen. Claire took the first set 6/1 and although Karen had a few half chances it was clear at this stage that unless Karen could produce something special then a quick final was a distinct possibility. Well Karen did produce something special. Serving almost exclusively the Railroad, and serving it superbly, she fought her way back into the match. Her deceptive crosscourt forehand – which was directed into the forehand corner from the receiving end – had enough work on it to catch Claire out. There was no more than a point in it when Claire was leading the set 4/3 and Karen had an opportunity to level at 4 all. From 5/3 it seemed as though Karen’s chance had slipped by but she managed to win the next game and as Claire showed a few signs of nerves it once again appeared as though Karen might take the match into a third set. However, in what turned out to be the final game, Claire regathered her composure in part by telling herself to “Finish it!” and played a strong game to win her first Singles World Championship. Claire showed all the skills and power that have made her an 8 handicap, and Karen played better than her handicap of 21. No doubt both players will improve even further in the years to come and the game can look forward to a healthy and entertaining rivalry between the pair. Last night we saw a new dawn for ladies tennis. Claire and Sarah Vigrass played power tennis the likes of which is usually reserved for top-line male pros to win the 2011 Ladies World Championship Doubles Final. Aged 20 and 23 respectively, the pair along with beaten finalist Karen Hird who is 22, showcased their wonderful talents as well as illustrating the positive direction that women’s tennis is moving in. The match itself was a mixture of power hitting from the Vigrass sisters and courageous defensive play from Hird and the RMTC’s very own Rosie Snell. Rose in particular made a number of volleys at the net and displayed as they say “Courage under Fire”. Karen also made Claire and Sarah work hard as she swept the back court making for many long rallies. Karen’s competitive traits have been at the forefront this tournament (she won her singles semi-final in 3 sets after dropping the first) but on this occasion they were not enough to deny Sarah and Claire. That the contest displayed the contrast between power and deft touch it reminded one of the lawn tennis contests between the Williams sisters and Martina Hingis. Sarah’s excellent Railroad serve mixed with Claire’s Drag complemented each other and ensured that they started most points on the front foot and once the rallies started both proved capable of ending a point with a thundering drive to either the Dedans or Grille. Aside from the match we had a good crowd in the Club for the Champagne Night which proved to be a great success. It would appear that we have a liking for Bollinger and Pol Champagne … what a surprise! The Champagne flowed and flowed and the party was still thinning out two in the morning. Well done once again to Annie Holden and Lizzie Brown in particular for all your efforts. The Ladies World Championship draw and results are now available on the website. Check back as the page will be updated when results are available. In honour of the Anzacs, twelve players turned out for a handicap doubles club tournament last Saturday afternoon. All the players seemed to enjoy a full afternoon with plenty of tennis, which was ably organised by Jonathan Howell. Many of the matches were very close, with score lines of 5/5 forty all. Vince Scopelitti managed at least two grille shots at crucial stages of his matches, supported by Robert Falconer who seemed to have mastered the pound serve, at one point he seemed to bowl Greg Reid with an unexpected serve. Tim Threlfall continued to improve, with at least two winning gallery shots, partnered by Mike MacAleavy who demonstrated his usual style with a lucky bounce in to the dedans to beat chase 1/2 a yard on match point. Mike and Tim continued their run throughout the afternoon to secure a place in the final. Peter Fenwick was noted at the most improved player of the day by Jonners. A buffet lunch was enjoyed by the players, thanks to Helen Wheeler and Jasmine Hewson for preparing it and serving the players during a tight schedule. Characteristically, the final was also a close fought match like so many of the matches were, Tim’s steadiness perhaps being the difference, Tim and Mike raced ahead to a 4/1 lead. Isabelle Carr and Richard Pagone then started to hit the targets, with Richard finding the tambour and Isabelle’s confidence growing, they turned the match around to defeat Tim Threlfall and Mike MacAleavy 6/4. Thanks to the Club Pres, Owen Guest for dropping in to mark the final and run the presentation.